April 25th saw the return of the Cookie Club with Professor Chris Binns from Leicester University presenting a lecture on the subject of Nanotechnology to a collection of Year 10 and 11 students. Nanotechnology means controlling devices or materials at an atomic or molecular scale, literally between 1 and 100 nanometres in size. 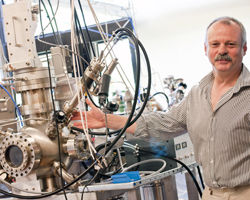 Professor Binns is currently engaged with some pioneering work to develop thin film solar technology that could be used to harness solar energy on a massive scale. The film could be coated onto windows orbuildings with much lower impact than the existing technology. In an engaging lecture, Professor Binns started by discussing the size of the nanoparticle in the nano world, then went on to discuss the 3 main areas of research in this area. He mentioned how the properties of materials change in the nano world, for example iron becomes a very strong permanent magnet as a nano particle, which could have all manner of uses. He closed by outlining some of the potential problems if unleashing nano particles into the world, one of them being the ‘Grey Goo’ theory!